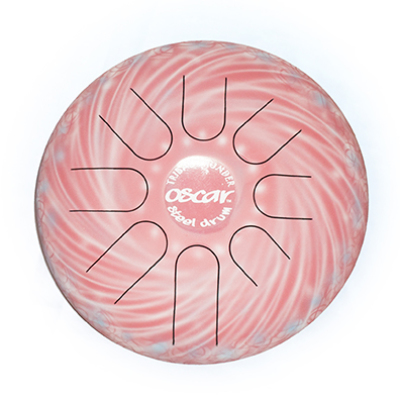 Thank you for your interest in the Oscar Steel Drum and for supporting our high quality, made in Canada, original steel tongue drum. If you are interested in finding out more about how the drums are made, visits to our humble workshop in Delhi, Ontario can be made by appointment. Contact us. For international sales, please contact us for price and shipping estimate. Seconds and overstock drums are occasionally available at discount. Made entirely of steel, comes with black canvas carrying case, two mallets and drum ring stand. Ideal for meditation, stress release, sound healing, learning about music and advancing musical technique. Suitable for all ages, with any or no musical background. Hand made from fired, carbon enhanced steel, polished and painted. Fire tuning is the delicate process which brings out the overtones and harmonics of the fundamental note. Roll over the image to magnify, might take few seconds.